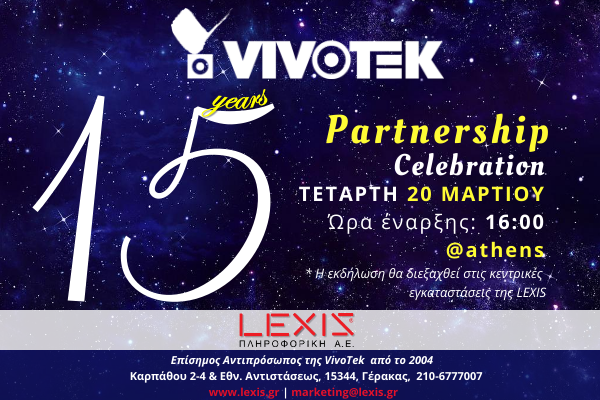 LEXIS SA and VIVOTEK invite you to join the event "LEXIS & VIVOTEK: 15 years Partnership Celebration" and celebrate with us 15 years partnership collaboration which will place on Wednesday, 20th of March, at 16:00 at LEXIS's HQ in Athens, Greece. During the event, the partners will have the chance to get informed on the new camera series focused on cyber attack with live demo, the launch of thermal camera technology and the deployment of smart Video Content Analysis (VCA). The presentation will be addressed to partners and resellers and will be held in English language by VivoTek's representatives. Participation is free and requires early registration due to limited seats. There will be coctail party with buffet after the presentation! Please confirm your participation at marketing@lexis.gr .